With the fall season here you know what that means … anything, and everything, pumpkin. I saw a whoopie pie recipe by Martha Stewart on Pinterest that looked so good that I had to give it a try. 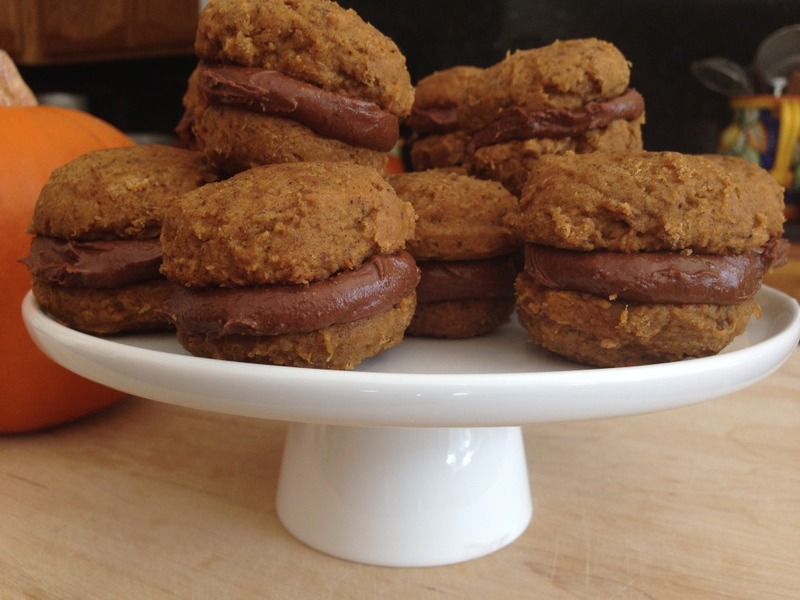 Hers were not gluten free, nor dairy free so I came up with my version of pumpkin whoopie pies, with nutella style spread. As soon as sugar pumpkins hit the grocery store I just had to get some to roast for homemade pumpkin puree. I didn’t want to go too traditional by filling it with a cream cheese frosting. And I happen to have some chocolate hazelnut spread that I recently discovered, and am completely addicted to, made by Justin’s. 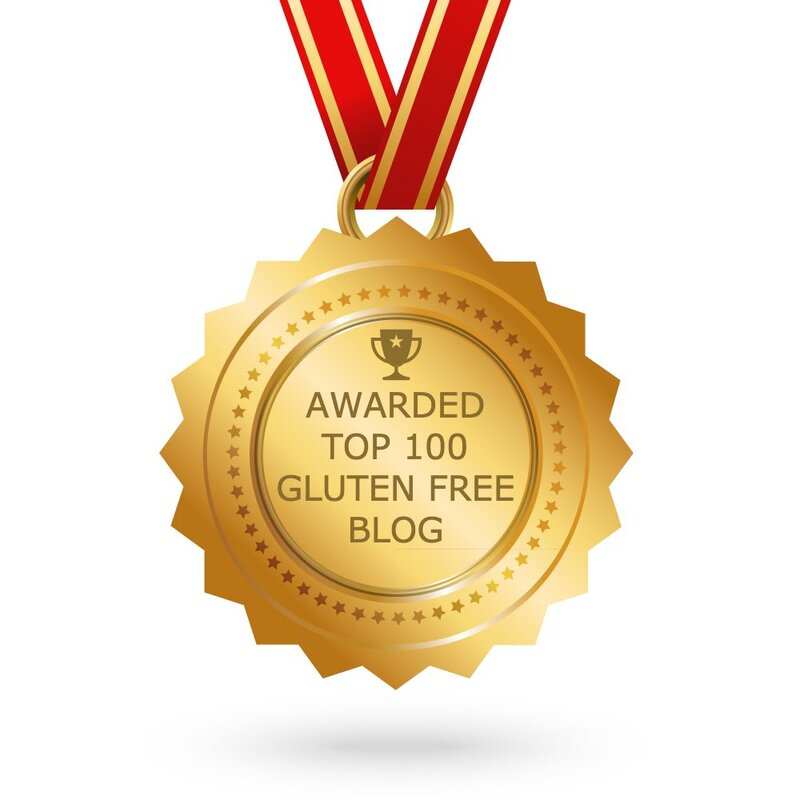 Vegan and gluten free! This stuff is dangerous, in a very good way. 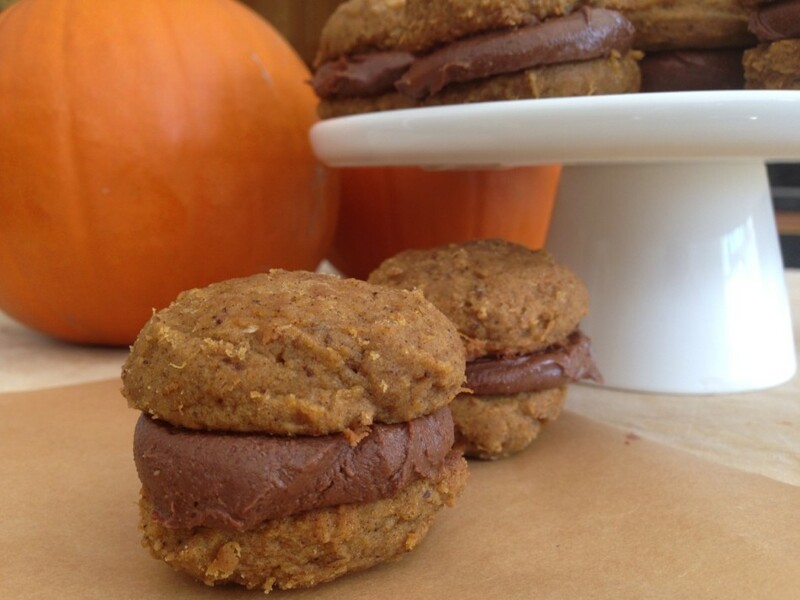 Pumpkin whoopie pies with chocolate hazelnut filling, imagine how good this is. The smell coming out of the oven was tantalizing. I had to make these mini, or I would have eaten them all. Bake these and you will understand my dilemma. 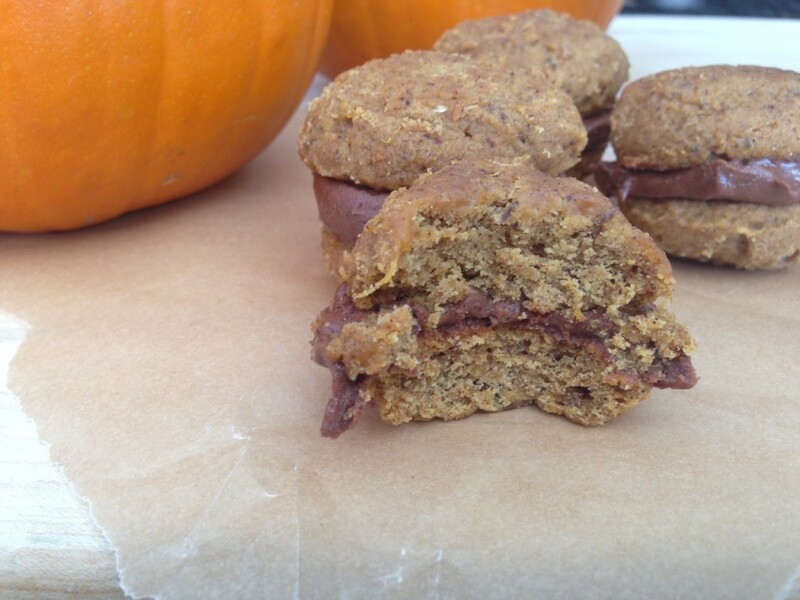 Soft, chewy, and full of pumpkin spice flavor sandwiched between nutella spread – yes, these will make you squeal with delight. 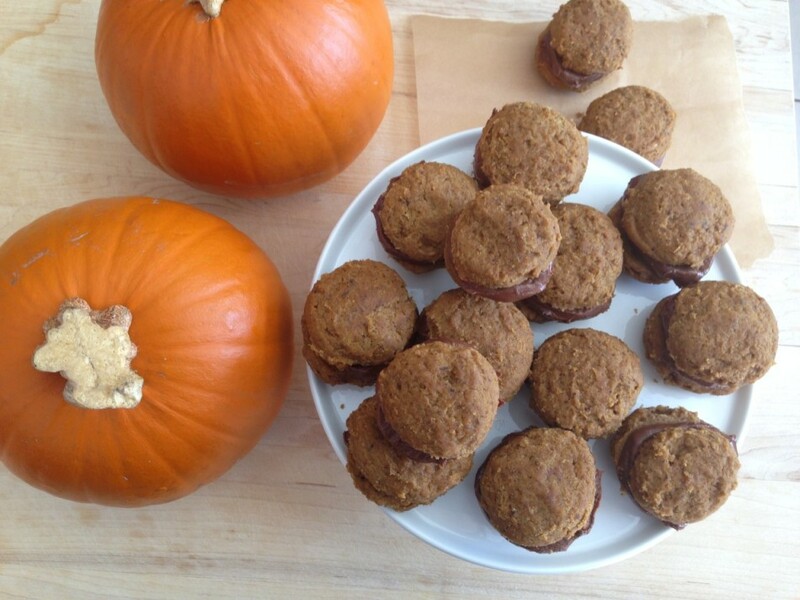 Ah, the pleasures of pumpkin in the fall … enjoy! 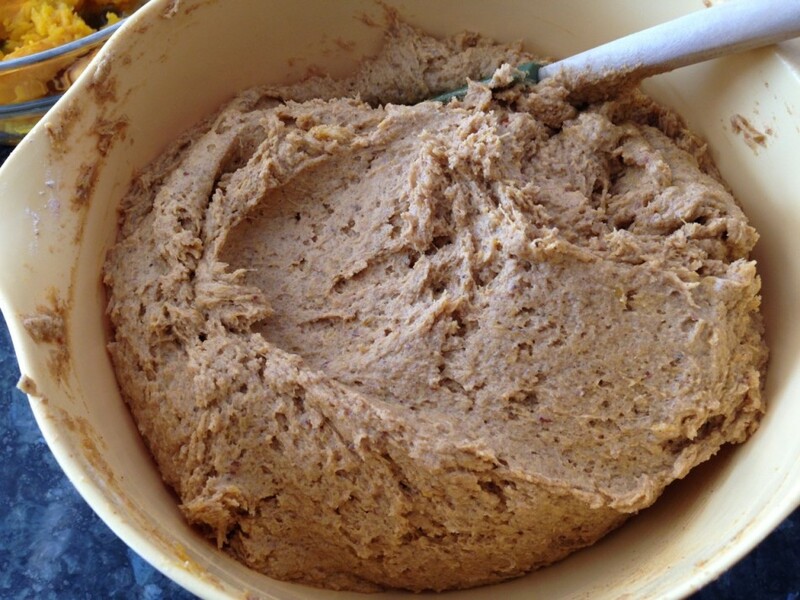 In a large bowl, sift or whisk together flour, salt, baking powder, baking soda, cinnamon, ginger, and cloves; set aside. In a stand mixer (or hand mixer) fitted with a paddle attachment, mix together brown sugar and shortening until well combined. Add pumpkin puree and continue to mix until combined. In a small bowl combine flax seed meal, hot water and oil. Mix and set aside. Add flaxseed mixture and vanilla, mix until well combined. 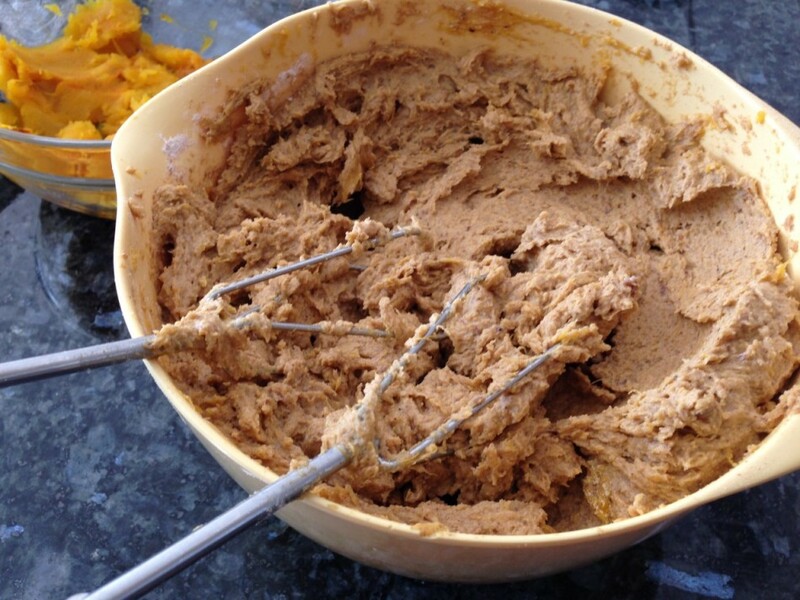 Slowly add in flour mixture to the pumpkin mixture and combine until fully incorporated. 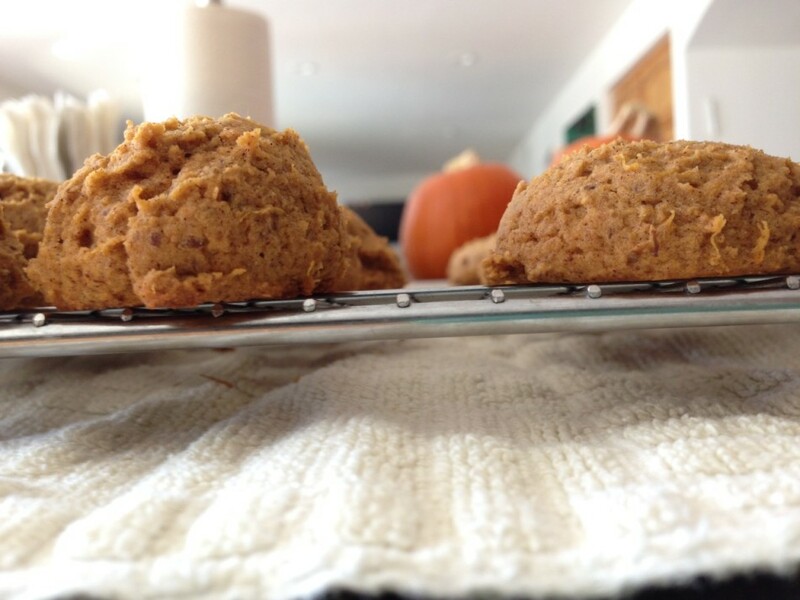 Using a small ice cream scoop with a release mechanism, drop heaping tablespoons of dough onto prepared baking sheets, about 1 inch apart. Gently press down each cooking before baking. *First 2 trays I followed Martha Stewart’s recipe but found they didn’t spread at all so I pressed down each cookie before baking. The height then came out more like a whoopie pie. Bake cookies for 15-20 minutes. Mine were perfect at 18 minutes in my wall oven. On the left is how Martha instructed, on the right is my pressed-down version. The ones on the left would make great cookies with some coconut chips and pecans. Yum. 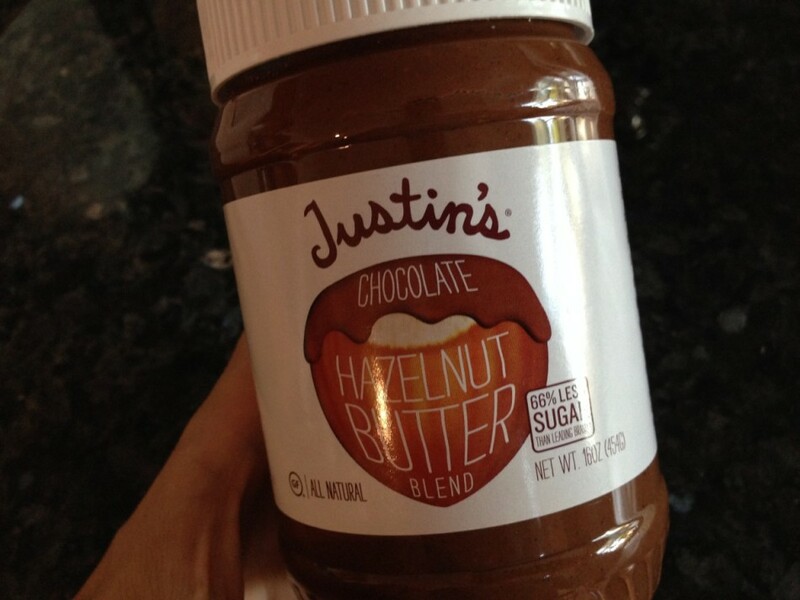 Scoop a tablespoonful of Justin’s Chocolate Hazelnut Butter (room temperature) onto half of the cookies. That’s it!! I used a small ice cream scooper; a spoon would work fine too. Sandwich the cookies by pressing down gently so that the filling spreads to the edge of the cookies. Transfer to prepared baking sheet and cover with parchment paper then plastic wrap (so they don’t stick). 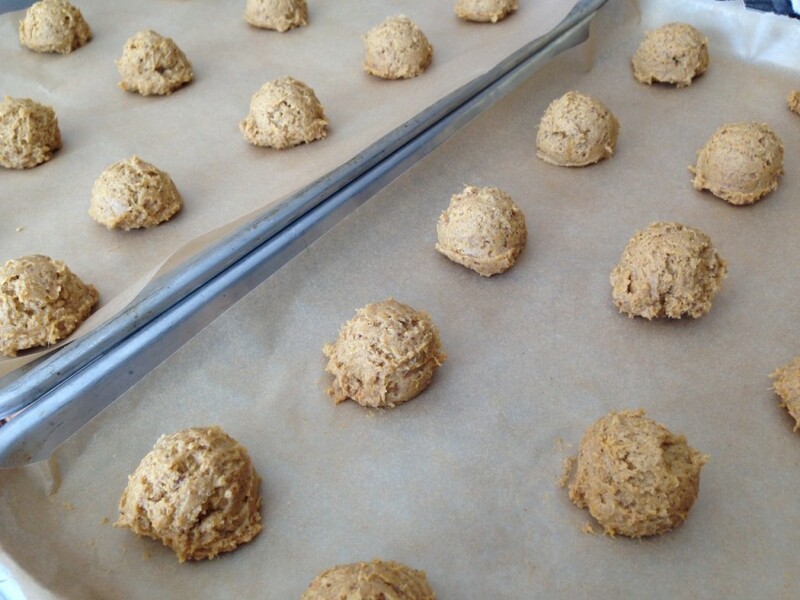 Refrigerate cookies at least 30 minutes before serving and up to 3 days. Serve cool or room temperature. Renee, you are so sweet, thank you!! So glad to hear you enjoyed it, they are pretty addictive! Took on this recipe as a weekend bake project. I followed your suggestion about pressing the dough down and they came out amazing with the nutella stuff. I can't stop eating them!!!!!! Hi this may sound funny but I do not have a stand mixer right now. Can I whisk by hand or should I buy one? I will need one soon I guess but for now. You can definitely whisk by hand, more difficult but a great bicep workout! Just make sure it is completely blended. A hand mixer is cheaper than a stand mixer, and will still do the job. Enjoy! jess curious.. (ha! ), do you watch food network? which shows do you like? Iris, I do. I love Ina's show, and Iron Chef!